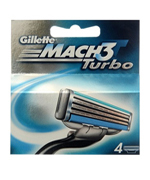 Buy Gillette Mach3 Turbo Cartridges. Elastomeric handle provides a secure grip and great control to help soothe nicks. Gillette Mach3 Turbo Cartridges Enhanced Lubrastrip with Aloe Vera that provides more lubrication to help the blades glide easily over the skin. An elastomeric handle provides a secure grip and great control to help soothe nicks and cuts. Get a close comfortable shave even on Day 30 with Gillette Mach 3 using cartridges. This is because it has 3 Blades with Diamond like coating that stay sharp longer to give you a great shave even on Day 30. Gillette’s 3 Blade Shaving Surface Technology with anti-friction razor blades gently glides across your face with incredible shaving ease and outstanding facial hair removal. With a shave this smooth, comfort is a slam-dunk. • Three progressively aligned blades deliver less pressure on the skin, while each blade shaves the hair progressively closer. This delivers a more efficient shave with fewer total strokes and less irritation. • Individually spring mounted blades and a pivoting head help the razor automatically adjust and respond to the curves of the face with each stroke. • Enhanced Lubrastrip with Aloe Vera that provides more lubrication to help the blades glide easily over the skin. • An elastomeric handle provides a secure grip and great control to help soothe nicks and cuts.